My earliest memory of a birthday goes back to maybe age 10, I am not quite sure. Even today I am as excited as I was as a kid. I honestly don’t know why. The “traditions” we followed, too heavy a word, I know, started few weeks before “the” day. My parents took my brother and I to Chellaram’s to buy a birthday dress. Chellaram’s was okay. It was the same kind of frocks, not a glamorous place. Nevertheless, the new dress was excitement enough. I distinctly remember the opening of KidsKemp. When we passed by KidsKemp, there was always a Santa with white beard and red attire waving at the passersby. It was so colorful. For one of my birthdays, after much pestering (my poor parents), took us to KidsKemp. It was like the mall of today. Beautiful frocks. My jaws dropped at the sight of the colors or let’s call it glamour and glitter of the place. It is my most luxurious shopping experience memory from childhood. KidsKemp was a one time affair. The prices were so inflated that we had to go back to Chellaram’s the following year. I still manage to get or save a new dress for my birthday, every year 😊. Each year on Jan 1st I would circle the date on the Deccan Herald and/or Malayala Manorama and/or Prajavani calendar. Big red mark, so that nobody forgot, just in case. Well, I don’t mark any calendars today, Google does that. But I kind of start reminding my family to remember to wish me. I told you at the beginning, that I was kind of.. well.. obsessed. Then we bought chocolates the day before to distribute at school. Oh what a privilege that was. The first period, class teacher walks in, spots you in a pretty dress, not the bottle green uniform, tells the class, “so, we have a birthday girl today.. come on class, let’s all sing for her.” As a child that was an i-am-on-top-of-the-world moment. That morning, my mother woke me up with a very happy smile on her face saying “happy birthday Indu”.. those words echo in my mind. She did this consistently for every year I was with her on October 1st. The smile, the affection, or the love, never faded once. I long for that love today. Then came evening. My neighbor’s kids and us bought some crepe paper and balloons, decorated the living room and waited for my father to come. He brought the cake and candles, every year. The number of candles matched my age. The light of those candles reflected the brightness on my face or maybe it was the other way around, I don’t know. I see the same brightness in my son’s face when the candles are lit and I love seeing that delight on his face. I get them even now, a cake, candles and the light of the candles. I don’t get a wish from my mother. The first ten minutes after I wake up are empty and quiet. But in some form I get her blessing and wish. I may be construing this completely in my mind, but the coincidences are too much to ignore. So I did receive special blessings today. 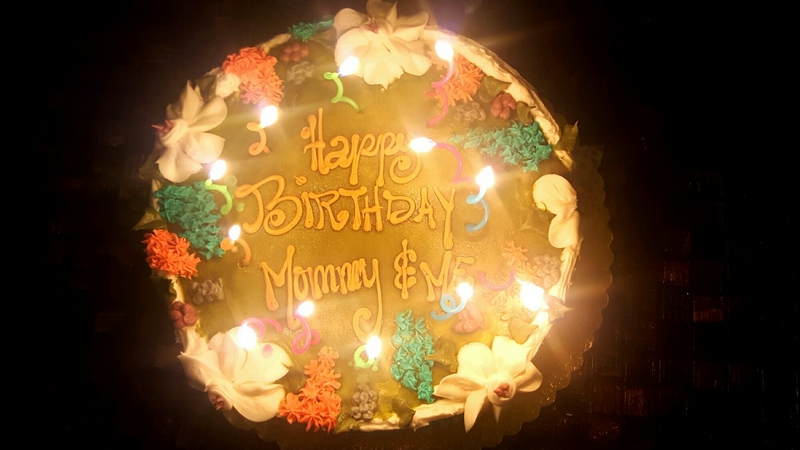 As I went to college, the family traditions of cake, decorations faded. It was a treat for friends at Nilgiris Bakery, Basavanagudi for starters, ending up with MotiMahal at Mangalore during engineering days. At work too, it was a treat for friends, I still got a new dress and cake. Gifts for birthday were never a major thing. Sometimes I got, sometimes I didn’t. What I valued were the people I got to celebrate my birthday with. All of them special people, very dear to the heart. After marriage, my husband pampered me with gifts. May not be every year, but the year’s he buys me something, they are out of this world. The best, always. These are gifts I never imagined I would get in my lifetime. Today was special. Friends spent an entire day preparing for the evening party. It was a double celebration, my son and I got a “happy birthday mommy and me” cake 😊.. pampered again with gifts, happiness and laughter. The best part was the cards my kids gave me, thanking me for the wonderful mother I am and wishing me happiness with other personal notes. The thoughts that were put in those cards, made my many many everydays’ perfect. My older one just wrote on an index card while my younger one picked out a pink flowers card, with lot of mushy words. Grateful! This is the only feeling at the end of the day.. for family.. for friends.. for all the love.. affection.. care.. it’s a lot to be blessed with. From the childhood days of buying clothes at Chellaram’s to the extreme luxury of driving a BMW at Bentonville, life has changed seasons many times; one thing that remains unchanged are the loving people I am surrounded by year after year.. truly blessed !! To Indian news channels !